Has anyone seen Blade Runner 2049? I saw it this weekend and thought it was one of the best sci-fi movies I've seen in quite a while. Ex-Machina was probably the best before this. The atmosphere of this sequel was very similar to the original and because that was so esoteric I think it's impressive that they pulled it off. Yes and I liked it, very seldom do I think that these long movies should have been so many minutes but here I did not mind. This movie was beautiful on the screen. I have problems with the story though, how this was another go at getting to the scenes that they wanted to shoot rather than making sense..GOTH does that and so many movies too....but this was fun enough that I did not care. So very risque for 2017 too, allowing women to be objects of mens longing, women (even if not human) wanting to be objects of the male gaze,,,,,, you dont see that very much anymore . Absolutely see this in a theater with recliners. I experienced this Sunday on the largest IMAX screen in North America. I'll be back to elaborate on my thoughts on the movie but I rated it a 10/10 and am expecting it to grab Oscar noms in scoring, cinematography, and a best picture nod. It's best seen in 2D with a 4K projector, if anyone is yet to see it, and on the largest possible screen you can see it on. Oooh. What did you think of Laser IMAX? It is supposed to offer unprecedented detail in darker scenes. I went last night. I left the theater after about 75 minutes. Absolutely the most boring movie I've seen in a long long time. I may have only walked out of 3 movies in my entire life. Absolutely beautiful movie scenes (although, not that unusual anymore; many movies look great), but I could not stay awake during the film. It wasn't even a late show (started at 6:30pm). Just out of curiosity, what do you consider a "good" Sci-Fi film? Example? It's one of the loveliest IMAX films I've witnessed. I googled Best Sci-fi Movies and found this list. Of the top 20 (Page 5), I've seen all of them except: #19, #17, #13, #2. The are all fantastic movies that I've seen multiple times. Some of them, more than 10 times. Not on this list, but in the same vein as Blade Runner, I think....I enjoyed very much Ex Machina, I, Robot, A.I. Interesting, we agree on a lot of movies, but strongly diverge on Blade Runner 2049. In any case, I'm sorry you didn't enjoy it, I think you missed out. It seems clear to me that this movie is a setup for a sequel. I hope that the poor box-office showing does not derail their plans for the next one. And I hope they can keep the same director since I think he did an incredible job. This type of movie (praying to be so) may have legs cinema wise. It most likely won't break even but hopefully it will come close to breaking even before leaving the movie theater. China will get their theatrical release in 10 days. Japan isn't on the Box Office Mojo foreign box office totals. They have to be getting a theatrical release. Sony is freaking Japanese. That only makes sense. Japan also has a 27 October 2017 release. Laser IMAX uses a much brighter source of light than is traditionally used in projectors. This means they have a lot more shades of gray between black and white. And that means it can convey a lot more detail in darker scenes that will look more muddled with traditional projectors. For the same reason Laser IMAX is also capable of displaying a much wider range of brilliant colors. For the four Christopher Nolan movies mastered on 15/70mm IMAX film (Dark Knight, Dark Knight Rises, Interstellar, Dunkirk) these stretched pixels are less than ideal. However, except for those four Christopher Nolan movies, "full IMAX" hollywood blockbusters (like Star Wars 7/8/9) are mastered from a 4K digital intermediate that stretches the pixels in exactly the same way. If a movie is produced from a 4K master with vertically stretched pixels, then there is no loss of resolution if it is shown on a 4K projector with vertically stretched pixels. Thats a great movie too. I didn’t make the list. 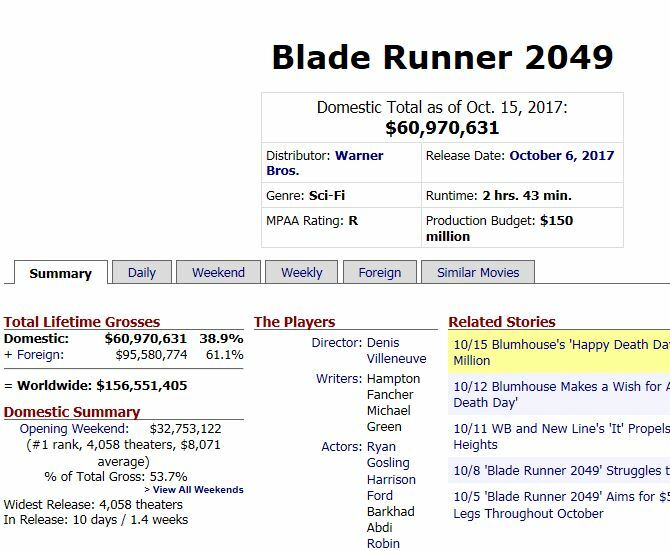 Nope, 2049 was horrible IMO. I'm curious, what do you think of the original Blade Runner? Also bad but not as bad. » Has anyone seen Blade Runner 2049?